...and speaking of lost cities: whoa. I don't know if anyone else does this, but when I read nonfiction, I go through the listed sources like a fine-toothed comb to find more about what I'm reading. 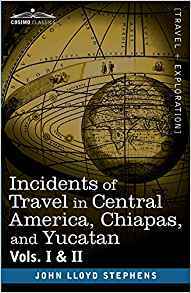 While I had some issues with the book, one very nice thing to come out of my reading of Preston's Lost City of the Monkey God was the reference to this book, Incidents of Travel in Central America, Chiapas, and Yucatan, Vols. I & II -- so voilá, within a few days it was in my mailbox. 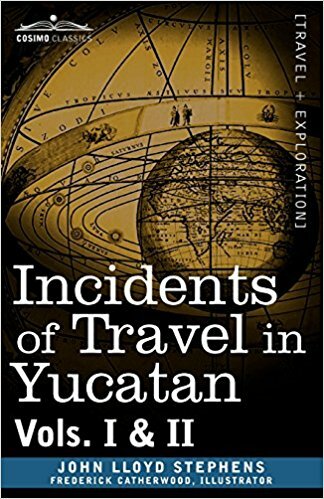 I had thought to only read the sections about the Yucatan since I was just there a few weeks ago, but I started from the beginning and got totally caught up in Stephens' book. What may seem dull to quite a lot of people kept me flipping pages. Stephens' account of his travels with partner Frederick Catherwood reads like an old-fashioned adventure story combined with history and the thrill of discovery as Stephens and Catherwood only make their way through Central America during a time of major political upheaval, battling dense jungles, illness, and even sharks while in a leaky boat. Its true importance though, as Carlsen so aptly describes in his own book, is that these two people "altered the world's understanding of human history." More on that later. After finishing that book and still hungry for more, I picked up Carlsen's Jungle of Stone, made it about halfway through, and then realized that Stephens had published yet another travel account, Incidents of Travel in Yucatan, also in two volumes. Like any good nerd would do, I put the Carlsen book on hold until I could read the second Stephens book, then picked it up again where I left off. 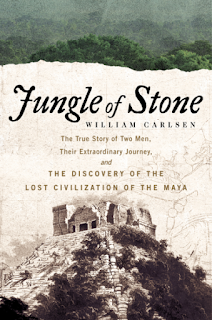 This book was less of an adventure story (although it did have its moments) than an account documenting the often-harrowing travels of Stephens and Catherwood through the Yucatan, where they made a circuit of several ruins from Copán to Tulum, as Carlsen calls it, "their last great ghost city." exploring the passages leading from the main chamber. Both books are very much worth looking into for anyone who has an interest in Central American history, the history of the Mayan civilization, and archaeology; it's also great for armchair travelers. But the most important thing about both of these books is explained very nicely in William Carlsen's book, Jungle of Stone. 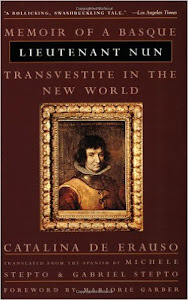 "the Americas had always been a land occupied by primitive, inferior people,"
"After the publication of their books, the mysterious stone ruins in Central America, the vast, sophisticated road network of the Inca in South America, and the monuments and temples of the Aztecs could no longer be viewed as the Lost Tribes of Israel, the ancient seafaring Phoenicians, or the survivors of lost Atlantis. They were understood to be solely indigenous in origin, the products of the imagination, intelligence and creativity of Native Americans." In short, Stephens and Catherwood not only paved the way for future exploration, but their discoveries and their keen awareness of the significance of what they'd found actually turned our own prevailing assumption about the development of civilization on its ear. And seriously, all you have to do is to visit a place like Chichen Itza or Tulum to discover the truth of what Carlsen (and earlier, Stephens) is saying. I can very highly recommend all three books here -- reading the first one was often like being in the middle of an adventure, and there were times when I wondered how this guy managed to stay alive. The second book was just sheer pleasure to read, and I'm already thinking that next year we'll go to Mérida as a home base for exploring more ruins. Carlsen's book is absolutely perfect for readers who may be interested but don't want to spend the time reading Stephens' accounts, since he gives the highlights of both but adds in so much more. I can't begin to say how much I enjoyed these books. I took this book along with me on vacation in Mexico a few weeks back and read it after a day touring Tulum. 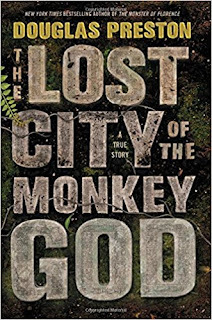 I know that Tulum is a Mayan site and is not in Honduras where the action in this book takes place, but being there and experiencing the ruins only whetted my appetite for a story of exploration in the dense jungles of the Central American rainforests. 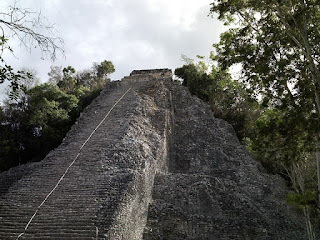 If the truth must be told, I'm also a huge devotee of stories concerning exploration and archaeology, both fiction and nonfiction, and I've been reading about archaeological finds since I was a kid. 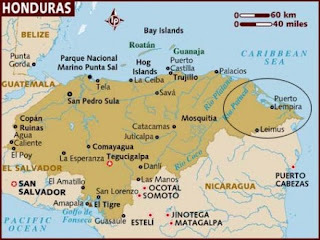 The "Lost City of the Monkey God" is one title for a lost city said to be "hidden in rugged Mosquitia," the circled area in the map below. What the map doesn't reveal is that this area that covers roughly thirty-two thousand miles, and that it is a "land of rainforests, swamps, lagoons, rivers and mountains." According to the author, the area was once labeled on maps as the Portal del Infierno, "the Gates of Hell." It is a dangerous place to explore, not only due to the hazards posed by "the thickest jungle in the world" but also because of the fact that, as Preston says, "Honduras has one of the highest murder rates in the world," and that a whopping eighty percent of the cocaine that comes to the US via South America comes through Honduras, "most of it via Mosquitia" leaving "much of the surrounding countryside and towns" of the area in the hands of the cartels. 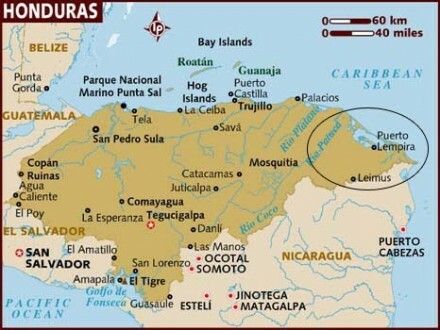 In 1526 Cortés wrote a report to Emperor Charles V while off the coast of Honduras, saying that he believed that there were "very extensive and rich provinces"... that "will exceed Mexico in riches..." According to Cortés, this "new land" was known by the Indians as "the Old Land of Red Earth," and it existed "somewhere in the mountains of Mosquitia." While he never explored there, twenty years later a missionary "found himself looking down on a large and prosperous city spread out in a river valley," and although he didn't go into the city, his report to Charles V kept the legend alive. The legends of as-yet undiscovered lost cities continued to flourish over the next few centuries, until as Preston says, "by the dawn of the twentieth century," they had "coalesced into a single legend of a sacred and forbidden Ciudad Blanca," so-named because of the stories collected by Pech Indians (aka the Paya) of Mosquitia that told about a "White House" located "beyond a pass in the mountains at the headwaters of two rivers." It was also known as "the City of the Monkey God," and more than one explorer set off in search for this legendary place. After going through a brief history of attempts to discover this lost city, Preston's account reveals how he joined an expedition to the area after a documentary filmmaker named Steve Elkins had decided to make a search of the area using lidar technology. The cost to do the whole area was prohibitive, so Elkins settled on a search area of about fifty square miles. The gist of the search you can read about here in a New Yorker article written by Douglas Preston in 2013; suffice it to say that not only did Elkins and his team discover one large site, they discovered a second one as well. Most of the book details the ground expedition -- pitfalls, surprises and discoveries, etc., -- as well as its aftermath. I have to say that I was pretty much glued to this book as far as this expedition goes because of my fascination with this sort of thing, and I do believe he does a fine job of relating events for armchair travelers like myself who will never be part of anything so exciting. He manages to do it in such a way that transmits the excitement, the frustrations, the hard work, the perils, etc., involved so that it becomes a bit of a page turner. 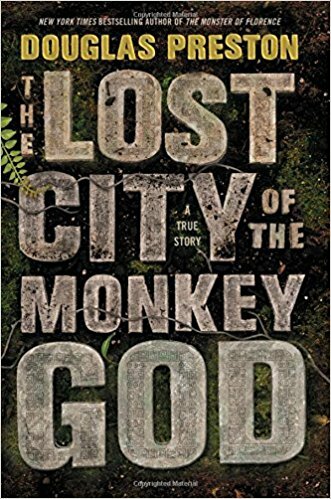 I also enjoyed reading about the history of other attempts at finding the Lost City that he provides, which puts the search for this particular site in a larger context. But having said that, I do have a couple of big niggles. Aside from a couple of issues re sources (using his brother Richard's books as source material for one example; not using more current scholarship that examines other possible reasons for decimation of indigenous peoples of the area as another example), I have a big complaint. Quite a bit of space was used by the author in this book to discuss a horrific illness that some of the expedition members picked up, brought on by bites from parasitic sand fleas at the team's camp. I didn't mind that so much, since it was interesting, but he uses this potentially-deadly illness to bring up dangerous effects of global warming. Now before anyone gets huffy, does the eyeroll, and starts calling me a denier, that's not the case at all. In fact, I totally share Preston's views about climate change and global warming. It's just that it came across as out of place in this book, and left me thinking that perhaps this is not the correct venue for that particular discussion. Another thing: the history of diseases brought to this area that he offers in making his point as to what may have caused the disappearance of the indigenous population of the "Lost City" is certainly compelling, but Preston is a journalist/author, not a scientist, and once again, his own speculations seemed misdirected and out of place here, especially without evidence from the site itself to back them up. On the whole, I enjoyed the story of the modern expedition, the history of the searches for the "Lost City," and as long as Preston stayed there, all was quite good and I'm happy to have read it. Considering the caveats mentioned above, I can recommend it to people like myself who are interested in this sort of thing. You can find more about this expedition, complete with short video, in an article the author wrote for The New Yorker of January 2017.